One of Oļeg’s best works. In 1995, it disappeared in an armed robbery. It took 7 years to create and it had never been displayed. I started doing creative work when I was six. My first major work in my preschool years was a wooden sailboat. At the age of 20, I started studying jewellery making at a jewellery factory. After a couple of years of training and graduation with a jeweller’s diploma, I started working at a jewellery shop where I learned a lot from old artisans and gained experience. In 1991, I launched Auzers’s Jewellery Art College where I taught my own concept of art. During that time, many monumental works were created. A 128 cm high fruit bowl weighing 20 kg created in 2001 became the first work in the silver collection of the restored House of Blackheads. Oļegs Auzers’s works were also highly valued by ex-President of Latvia Vaira Vīķe Freiberga who had ordered his pieces to represent Latvia during her presidency. The artist’s contribution to culture is not only his students, but also his gifts to the House of Blackheads, Museum of the History of Rīga and Navigation, Limbaži Museum and the Swiss National Museum in Zurich. 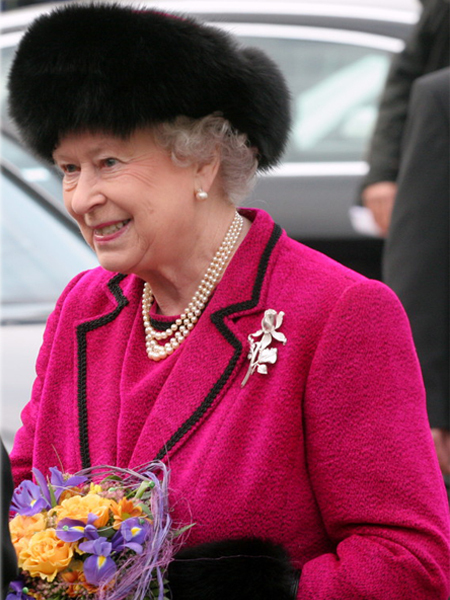 The picture shows Queen of the United Kingdom and British Overseas Territories Elizabeth II wearing a brooch made by Oļegs Auzers. Being a jeweller means confidence, stability and financial well-being. Your previous skills, your age or gender, they all do not matter. There are day, evening and weekend classes, in groups or private. To help you master jewellery making and find your path in this skill, I have created a three-month preparation course. During this time, you can learn how to solder, engrave, chisel, forge, work with metal, fix stones and create complex chains, rings, earrings, pendants and bracelets. You will also learn drawing, sculpture and composition. It will allow the apprentices to overcome their fear and lack of confidence.